Are you fond of baking? If you are then you should invest in a quality stand mixer. It will make your ingredient mixing activities more efficient and faster. This is a very useful kitchen tool that you should have. 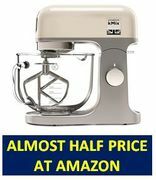 You can purchase cheap stand mixers from your favourite UK retailers including ASDA, eBay, and Amazon. 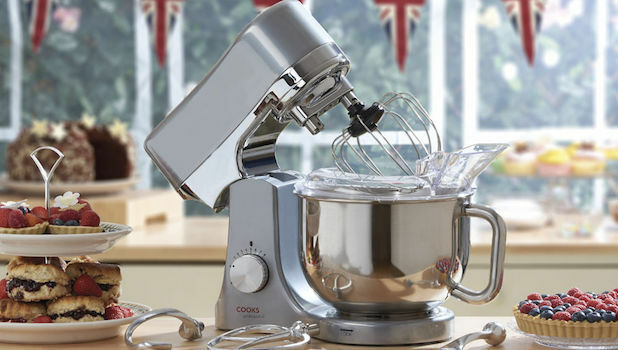 Just use the latest discount codes to save as much as 90% on selected stand mixers. Choose from a wide variety of models and brands that are available. This is one of the most important equipment that you should have in your kitchen. VonShef 1000W Cream Food Stand Mixer - Save £25! 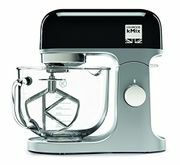 Kenwood - White 'kMix' Stand Mixer KMX754WH - 60% Off! All the latest stand mixer sale and deals in the UK! The purpose of mixers is to mix, fold, beat, and whip different food ingredients. It comes in two types, hand mixer and stand mixer. The stand mixer is one of the most powerful and functional appliances you can ever have in your kitchen. The first patent issued on what is claimed to be an electric mixer was on November 17, 1885 to Rufus M. Eastman. He utilised water power, mechanical power and electrical power on his invention. However it was in 1908 when the electric stand mixer was invented by an engineer named Herbert Johnson for Hobart Manufacturing Company. He was inspired from observing a local baker mixing bread dough using just a metal spoon. Seven years later, his 80-quart mixer was being used by numerous large bakeries, and in 1919 he introduced a mixer for the home, Kitchenaid. The said gadget may be considered as a pair of beefy and big arms found in your kitchen. You can always use them if you need a hand in your mixing tasks, or if you are busy with one recipe to another. Not to underestimate anyone, but it is actually more efficient if you are going to use it in combining ingredients - no human could ever perfect the job better than a mixer. How Can I Get Cheap Stand Mixer Deals Online? If you love baking or cooking in general, your tools will not be complete without a stand mixer. Today, the best affordable stand mixer is just within your fingertips. Here at Latest Deals, you’ll find the best stand mixer sale, from top brands like Cooks Professional stand mixer, Kenwood, Morphy Richards, and KitchenAid. We have all the styles available from modern to Swan retro stand mixer and from the best affordable stand mixer to the best stand mixer UK. Our community of bargain hunters are always sharing verified deals, price drops, and discounts on stand mixers from major UK retailers to ensure you will get the best possible savings around. Moreover, we have a team of money-saving experts who regularly share shopping tips and tricks that can provide you with some fantastic money off on your online and instore purchases. Most UK retailers have clearance sale events such as Black Friday, where you can get massive discounts which can go up to 70% on a wide selection of stand mixers. Take advantage of the additional savings you can get by using the latest stand mixer voucher code you can find here. There are also offers where you can get freebies and free shipping. The Ultimate Consideration. The purpose of the mixer you are about to buy is the first consideration. If you are a person who bakes on family and social events, or if you have to create several loaves of breads weekly, or you need a powerful motor and even a large capacity bowl, you should think about the watts of power you are going to secure. The safest would have to be the 600 and a 6 qt bowl may suffice. Power Performance and Capacity. When the wattage is higher, there would surely be more power provided in kneading and mixing. Please be aware though that this is not the usual case for most units out there. There are some mixers out there that utilise even more wattage so that they can operate as compared to other models. It may be wiser if you stick to looking at the capacity prior to buying. It is not just about the advertised wattage after all. There are manufacturers out there that would recommend capacity guidelines. Hence, these can be helpful; however, remember that they may not work for optimum mixing. Always base your decision on the reduced capacity level. This should work. Mixer Features. It may be a good idea to look into overload protection. This is a useful feature. The same is also true with a locking tilt head that you should also check. For most of the time, all-metal constructions are durable. They are of 10-12 speeds, on average and they can also stand 3 standard attachments - whisk, beater and dough hook. There are models that have a timer onboard so that you would not have to guess. On the other hand, there are also those with splash guard so that there would not be any spills on your workplace. To protect the unit, there should be a motor that can ramp up the speed. It is also purposeful to have models along with hubs so that optional accessories may be connected when needed. Of course, warranties are not the same. They may differ from one brand to another. Look for ones that are offered in a longer period of time. Limitations. Like any other, stand mixers also have their own set of limitations, and you should be aware of them. While it is natural that you expect a high-wattage mixer to be capable of handling any sort of dough, they still have restrictions. The best mixers may still have trouble when they handle stiff though. More often than not, they will cause the motor to be stall and sluggish. This only shows that the mixer is not meant to handle the mentioned capacity or denseness of the dough. Accessories. There are optional accessories for stand mixers such as a vegetable or meat grinder, and a pasta or sausage mixer. Of course - these come with a price too. They can make your purchase a little expensive than the usual. However, the good news is that they would reduce the number of appliances you might need. The only important thing though is that you have sufficient power for the operation. Also consider the power level in order for this to be even more efficient. Quality. It is true that you may stumble upon a wide range of prices when it comes to your pick of stand mixers. So if you have time and you are really taking your finding seriously, do not fail to know what causes the price to rise up. There must be features that can justify them. In the case of a base model, there is only a sole mixing action which is in the middle. As for a higher-priced unit, there might be a rotating or spiral action which can cover the wide mixing area. This may also get closer to the particular side of the bowl. If there is more power, there is more that you can do with the mixer. When the units are more expensive, they would have to include durable parts and all-metal construction too. Mess and Hands-Free. One of the biggest advantages of having a stand mixer is that it would enable you to make a hands-free preparation and baking. With a very little amount of effort, it would not be an issue to mix and mash and blend everything without even getting your hands dirty. Versatile. There is a misconception that stand mixers are only intended for dough, cakes and meringues. Well, this product is more than that. The truth is, there are so many things you can do with this which is why it is considered to be an essential kitchen tool which is capable of creation. Starting with a pizza dough to a cupcake, you can have a stand mixer to be of help in your baking. Reliability and Efficiency. It is also important to note that these stand mixers are both efficient and reliable by nature. They can surely be used for the years to come. Since they are built with the tradition of lasting quality, you can be certain that they are of optimal durability. It should not matter how long the mixing has to occur. You must be able of combining them and that should work for sure. Power and Control. With a stand mixer, you give yourself control and power to mix. At least, you can take the weight off your hands and arms. You should stick to a brand with a durable motor though. There should also be modifications and options for the speed. As such occurs, you can be assured that even the toughest dough will be able to blend without you having a hard time at all. If there is a tilt-locking head and a bowl selector, all of these would complete the deal.